Pacifica Senior Living Country Crest was very nice, immaculate, pretty, and beautiful. The view is the best out of all the ones we visited. Irene and Patricia, the people who gave us the tour, were both very nice people. We ate there once, and the food was good. The dining area was also good. There were a lot of things to do there. I live out of state and I was very nervous about my parents moving into an assisted living facility but after spending a week with my parents helping them get settled in I am very well pleased. I stayed at the facility with my parents and I got a very upfront experience with the staff and routines. Everyone was very responsive to our needs and helped us navigate through a very sticky situation. With Patricia and Sharon there I am very confident that my parents are in a very caring and clean facility. The food is outstanding, I ate almost every meal there for a week. The entire staff has been extremely helpful with this transition for my father. Any questions I have asked of the staff (Wendy, Sharon, Patricia, Cindy, Casey, Vanessa and Jamie) have been answered quickly and professionally. I would highly recommend Pacifica to others who are in need of a senior living facility. I have to say I was pleasantly surprised when I came to Pacifica Senior Living Country Crest over 2 years ago. It has been and is still a wonderful place to live, better then expected. It is kept very clean. The food is GOOD. The staff are pleasant and helpful. I am very active and I appreciate I am able to run two of the resident exercise classes. The best part is it is run very well by a bunch of great women. Pacifica Senior Living Country Crest is one of the best places I have seen. It is a nice place and everybody seems to be really nice. Mom has a really nice and big room. We brought her own furniture. It has a walk-in closet and a balcony that has plexiglass on it, so she can't fall out. She shares the bathroom, though. They come and get her for breakfast, lunch, and dinner, do her laundry twice a week, and make sure she gets her shower. They have different activities such as trips to restaurants, bingo, card games, and people coming in to play the piano or to sing. Yesterday, they were making snowman in the memory care unit. They have a hair salon and are located in a very nice area. Their price is very affordable. Thank you for leaving this detailed review about your experience with our community. We appreciate it and look forward to seeing you again. We are always more than happy to assist you if anything comes up. We hope you have a wonderful day. We visited Pacifica two or three times, but the price was high. They take them out to Reno and play Bingo and some tennis. They have a swimming pool. Residents seemed to lose track of the outside world, and at my age, I don't like that. They served a very good lunch of sandwiches and soup. Thank you Miem for your review. Your opinion is very important to us and we are glad to hear that you enjoyed your meal. We thank you for considering our community and hope to see you again soon. Did you know we have a Facebook page with pictures of our residents and their interesting activities? (The link to the Facebook page is on our website). Please feel free to contact with any and all questions, we are here to help! (530) 712-3100. My Father has been at Pacifica Country Crest for almost six months. After my Mother died we thought it would be a good option for him socially. He has met numerous friends, has beautiful meals in the all day restaurant and is very involved in programs they offer. He has enjoyed it so much, that he is now an Ambassador for the community and helps with all their events and new residents. We highly recommend this facility. Thanks for the feedback Lawrence. We strive to provide excellent care and service to our residents and their families at Pacifica Senior Living Country Crest. We appreciate you taking the time to leave us a review! We are very happy to hear that your Dad is happy and excelling here with us. Thank you! We're happy and set up to go to Pacifica Senior Living Country Crest in a ground floor apartment. They have a five-star restaurant. I had been up there before and heard nothing but good reports about it. Nobody ever has any complaints about it and said how good the food is and how well the people treat you there. The lady that set us up has been wonderful and bought some of the things that we had for sale. It's really worked out well. They have birthday parties and different things all throughout the month. I met their nice driver who's been there for 12 years and takes them to doctors' appointments and to outside activities during the week. Almost all of their people have been there for a long time. Everybody is cordial. They have coffee in the main lobby all the time and make popcorn and have cookies. They have tables where people can play games and cards or just sit and talk. They're building their restaurant up on the second floor and a patio outside with umbrellas so you can eat out there if you want to. They change the menu quite often. You don't have to pick what you want to eat way ahead of time; you just go down like you would to a restaurant and order what you want then. I'm looking forward to that because I do not cook anymore. Hi Leonora & Jim, thank you so much for your positive review! We are so appreciative you took the time to share your thoughts and experience. We are also grateful you chose our community and will do our absolute best to ensure your happiness. If you have any questions or concerns please let us know right away at the community. We look forward to seeing you around the community! The only real problem I have right now with Pacifica is that they’re in the middle of construction. They’re building another wing and due to the construction, it really bothered me to see that they’re hammering and nailing. It seems unsettling for people to move in right now. I have a friend who lives there, and he told me that the staff is really wonderful. I believe their staff is good and the people are nice, but the idea that there is construction going on kind of turned me off to considering it. They only had one place available, and it’s a really wide room and really pricey because it was a bigger unit, so they’ll charge you a pretty good price for that. They did have some activities going on down in the lobby area, which was very nice, like people playing games and staff interacting well with them. It looked fun, and the people were having a good time. The dining area looked really nice and well laid out. They always give you good menu with good food and stuff. The menu and food looked good. I believe that they really do well with the people there. The worst thing I saw was the construction, and they’re in phase three adding onto the locked down unit area. It’s obviously nice, but with what’s going on, I just didn’t think that my mom is going to fit well in there with all of the noise and construction workers going in and out. Zane, thank you for leaving this detailed feedback about your experience with our community. We are very proud of our community and our staff! We have a great team and genuinely care for all our residents. We hope that you find the community that best fits your mother's needs and that you are happy in the community you choose. We thank you for your consideration. I have been to the communities in Oroville and found that this was the nicest place available. The remodeling in progress is very upscale and has a warm, rich feeling when you walk in the front door. The food served in their Dining Room was very good. The facility as a whole appeared to be very clean and well maintained. The Staff was warm and friendly. I plan on placing my Father there as soon as his house sells. Justina L., thank you for leaving this detailed review about your experience with our community. We appreciate it. My Mother in Law lives at Pacifica Country Crest and we could not be more pleased! We looked at most of the communities in the area and this one is by far the best. The food is amazing, my Mother in Law loves to meet her friends for meals. The care staff is so kind and the community itself is beautiful and always immaculate! Thanks for the review, Peggy. We strive to provide excellent care and service to our residents and their families at Pacifica Senior Living Country Crest. We appreciate you taking the time to leave us a review! As far as I'm concerned, the quality of care is excellent. I would highly recommend them to a friend. Staff is very friendly and personable. Thank you for your positive review! We appreciate the kind words and agree with you! We are very proud of our community and the level of care we provide! We have a great staff and genuinely care for all our residents and it shows. We found Pacifica Senior Living Country Crest. Basically, we chose it because we could get a bigger unit for the same or less amount of money and it was the place my mother had always said she wanted to go to when and if it became necessary. I have nothing against the other facilities; this one just had more to offer for the same price and she has some friends there, so that made our choice easy. Our overall experience with it has been great. Regarding the room, the combination that my mother has is wonderful. It is a one-bedroom unit with a bath and a half, a full kitchen, a den, and a little terrace, which is very nice. They have activities planned everyday; however, my mom has only been there for four weeks, so I'm not sure if she has really taken advantage of them. I do know they take them shopping to Visitor Center, which is at the Oroville Dam (where there is a museum). They take them out to dinner to certain places. However, I have only seen these posted on the board. I have eaten with my mother in the dining hall, which is also quite nice and quite good, and the menu offered a great variety of food. Overall, what I like about Pacifica Senior Living is that my mom is happy there. Colleen12, thank you for taking the time to leave us feedback. I am completely independent. No assistance, so I can't comment on assistant care since I have not experienced it. The services I have -- 1 meal/day, housekeeping, maintenance, activities -- are very good. It is a pleasant, comfortable, friendly place to live. We have visited the room that our Dad is in and it is large and friendly. We live out of State and call weekly to catch up on what Dad is doing and the staff is always helpful and makes sure that Dad joins in on all activities. they go for outings once a week and make sure Dad is joining the group as well as involved in all activities at the home. The staff is very friendly and helpful. Watches our loved one wonderfully! Thank you Mackay, we appreciate your feedback! We always strive to provide top quality service to every resident and their families, and are pleased to hear that you enjoyed your experience here at Pacifica Senior Living Country Crest. My mother lived before at Pacifica Senior Living Country Crest and it was very unsatisfactory. They were not giving her the appropriate care and they did not tell us that they could not provide the care that she needed. The food was fine. All of the exterior things were fine, but they just did not really have the capacity or the knowledge or the people who had the ability to take care of her. She was neglected and she has gotten outside of the facility one day. Thank you for your review, we want to let you know that we take your comments seriously and we are sorry to hear that you did not have a positive experience. One of the things we pride ourselves on is our ability to successfully connect with everyone who walks through our doors and to take excellent care of our residents. We would welcome the opportunity to talk with you further regarding your experience and even re-schedule a return visit so that we can show you just how committed to all our residents and staff we really are. We'd like the opportunity to make this up to you, so if you're willing, please contact our community at (530) 712-3100. Required training and monthly ongoing training. Describe the overall population of assisted living residents at Pacifica Senior Living Country Crest. What is their average age? What are their favorite things to do? What programs or activities does Pacifica Senior Living Country Crest offer to enrich residents' well-being? What places are near Pacifica Senior Living Country Crest or within walking distance for assisted living residents to enjoy? Bird Cage Theatre, Performance arts center, Trips to the glass blowing company, Museum, Wine Tasting. What transportation services does Pacifica Senior Living Country Crest offer to assisted living residents? Our bus and van driver is available through the communities transportation department. Scheduled services take residents to nearby medical appointments, shopping trips, religious services, banks, postal services, special events and more. What makes the chef or dining program at Pacifica Senior Living Country Crest exceptional? What kind of menu can assisted living residents expect? Dining is a delight at Pacifica Senior Living Country Crest. Meals are prepared fresh daily by our on-site chefs & staff and are served in beautifully appointed restaurant-style settings by attentive dining staff. What safety features or security measures does Pacifica Senior Living Country Crest offer to assisted living residents? Personal call buttons with wander-guard and a fall detection feature. How does Pacifica Senior Living Country Crest keep residents' families informed about their loved ones? Written care plans, phone calls and emails. What is the care staff-to-resident ratio at Pacifica Senior Living Country Crest during daytime and nighttime hours? The community will have enough staff necessary to meet the health and safety needs of residents. If Pacifica Senior Living Country Crest accepts dogs or cats, what indoor/outdoor areas can they enjoy? We do accept pets and have large grounds they may enjoy with their owner. 40 hours of initial training and monthly ongoing training. Describe the overall population of independent living residents at Pacifica Senior Living Country Crest. What is their average age? What are their favorite things to do? What are some recent off-site events that the community activity director at Pacifica Senior Living Country Crest has organized? Old Sacramento stroll and lunch at Joe's Crab Shack. Nevada City lunch at Blue Moon Cafe and shopping and more! What transportation services does Pacifica Senior Living Country Crest offer to independent living residents? What makes the chef or dining program at Pacifica Senior Living Country Crest exceptional? What kind of menu can independent living residents expect? What safety features or security measures does Pacifica Senior Living Country Crest offer to independent living residents? Many grassy and paved areas are located throughout our community. We love pets and offer pet therapy for our residents as well. Does Pacifica Senior Living Country Crest work with an agency or registry to provide nursing and medical assistance as needed? What safety features or security measures does Pacifica Senior Living Country Crest provide to protect residents who wander? We have a secure 27 apartment memory care center called Legacies dedicated to dementia residents. What programs or activities does Pacifica Senior Living Country Crest offer to keep residents engaged? How does the staff engage residents' long-term memories? A monthly Activity calendar is created and staff conducts small group activities. Our Resident Supervisor. Residents are regularly reassessed to make sure the most appropriate support is delivered. What techniques does Pacifica Senior Living Country Crest use to support memory care residents during mealtimes? Residents are supervised by the staff and assist with their meals. How does Pacifica Senior Living Country Crest keep residents' families informed about their loved ones' health? Describe the neighborhood around Pacifica Senior Living Country Crest. Is it located in a residential neighborhood, a business district, a rural setting, or other type of locale? Is Pacifica Senior Living Country Crest affiliated with a hospital if more care is needed? Not at this time. There is a close by skilled nursing facility but they are not associated with us. Features Extra: Library, W/D In Apt. Our residents enjoy a lifestyle of choice. Our professional team members assist residents in maintaining a sense of freedom while keeping awareness for when additional needs may become necessary. We are committed to not only serving our residents, but giving our families, peace of mind. Our community is a place where you'll feel right at home...a comfortable and caring environment, where our commitment to excellence is visible in everything we do...every day. Pacifica Country Crest offers the largest apartments in Butte County, each with a full kitchen and private balcony or patio. 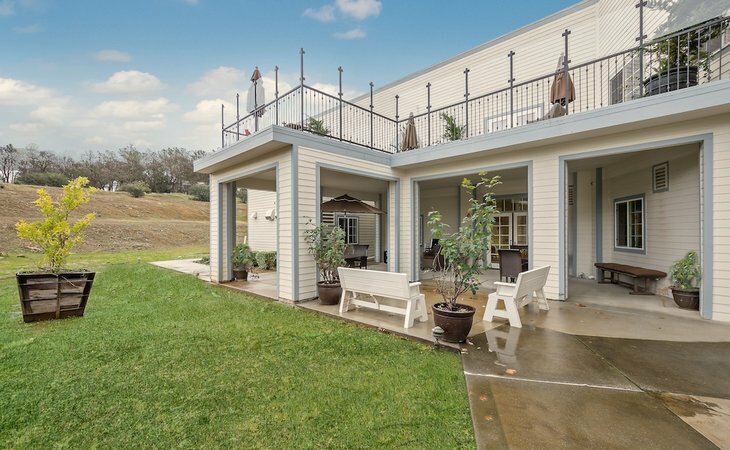 A 17-acre three story community providing some of the best views in senior living in Oroville. Offering three levels of care, Independent and Assisted living and in January 2015, a new Memory Care neighborhood. What should caregivers and potential residents know about Pacifica Senior Living Country Crest?